Prophets may not know everything, but author Caseen Gaines sure knows a lot. He's penned The Dark Crystal: The Ultimate Visual History, an upcoming book from Insight Editions that features a number of facts, interviews, never before seen concept art, rare artwork, on-set pictures, and basically all the things about the making of the 1982 film. What sort of tidbits does the book go into? I'm so glad you asked. One thing: Aughra was initially conceived as "an ornery male" named Habeetabat. The movie from Jim Henson is one of those classics that's always going to pique interest, but the world of the Gelfings and Skeksis is perhaps more appealing at the moment because of the upcoming Netflix series. The Dark Crystal: Age of Resistance, slated to beginning shooting this fall, is a prequel set decades before the events in The Dark Crystal. So, what better time to take a deeper dive into the world and explore the genesis of the story treatment and script? The idea of the almost 200 page book is to tell the complete behind-the-scenes story and delve into the concepts Henson had in his head when he dreamed up this magical world. You can get a bigger bite of the book by viewing some sample spreads in the gallery below. You'll find a Skeksis castle sketch, a bit about how Frank Oz recommended Kira get a pet, the spiritual elements for the story, and more. 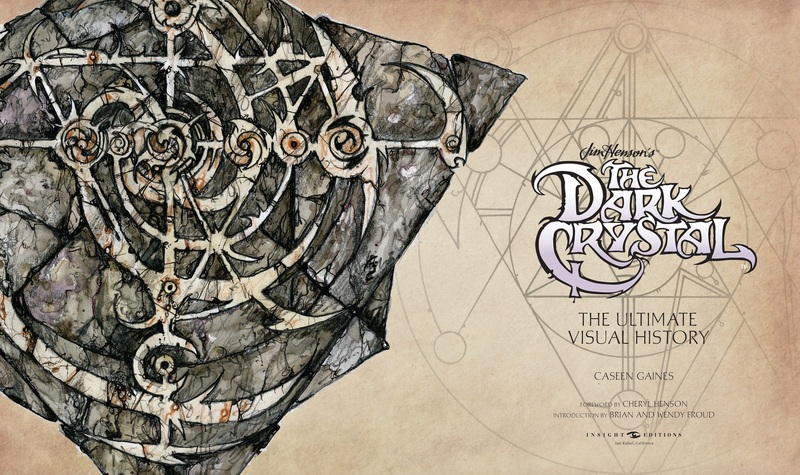 The Dark Crystal: The Ultimate Visual History will be available to purchase in September. Have a favorite quote from The Dark Crystal? Drop it in the comments before you leave.